Lotus, in Withington, is an entirely vegetarian Chinese restaurant and takeaway. It boasts a large menu of tofu, vegetable, and fake meat dishes. Even including a vegetarian eel main (though we’re unsure whether anyone has actually ever ordered it). Becca is a meat-eater and Indy has been vegetarian since last Easter, so we came to the food with two different perspectives. On a price point, Lotus is on the higher end of a student budget; most mains are around £10, and starters about £5. 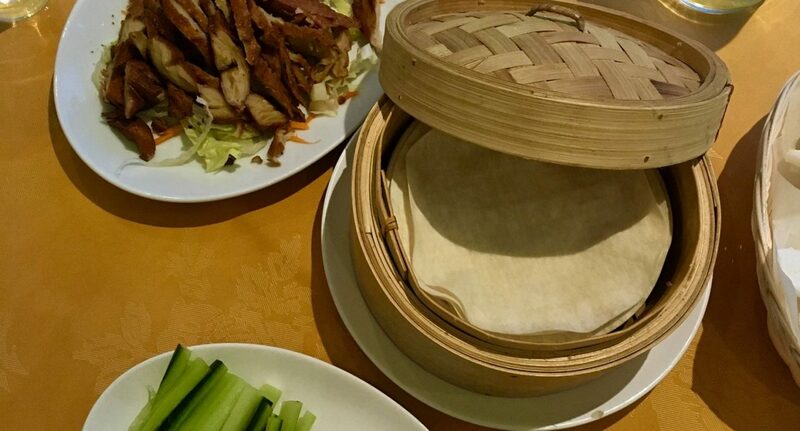 We shared ‘duck pancakes’, two mains, and a rice for £31.50. They did give us free prawn crackers though, which is always a bonus. Takeaway is also 10% off – worth bearing in mind for a cosy Friday night in. We’d booked our table for 7pm on a Friday, but were starving by 6. We rocked up at 6.20pm, and they were more than happy to seat us straight away. It was empty when we arrived, but the restaurant quickly filled up and was full when we left at 7.30pm. It’s definitely worth booking on a Friday night. They don’t serve alcohol, but the restaurant is BYOB with a corkage fee of £3 for a bottle of wine and £1 for beer. Not bad. We started the meal with ‘duck’ pancakes – a classic. Indy: They tasted pretty much exactly as I remember actual hoisin duck pancakes tasting — soft in the middle and crispy on the outside. The ‘meat’ blended well with the rich hoisin sauce and crunchy cucumber sticks. Becca: From a meat-eater’s perspective, I’ve found that Quorn substitutes often have quite a solid texture. This reminds me I’m eating a meat alternative more than this duck did. But I did find that in the pancake the duck tasted really good and was really crispy on the outside like the original. Overall: When mixed together and eaten as a roll, all of the ingredients work for a sweet, crunchy, chewy result. Also, good to bear in mind that the duck costs £10 even if you’re a party of up to 4 people. So you can save money by splitting it between a bigger party. The mains arrived almost immediately after the starters were cleared away. The service was very prompt, and the waiters were very attentive. Indy: They’d misheard my order of salt and pepper chicken as sweet and sour, but apologised for the mistake and happily replaced the dish quickly and politely. When I saw the salt and pepper chicken, I baulked slightly as there was no sauce with the dish. It didn’t say whether there was or not on the menu, so it’s worth asking if it’s a game-changer for you! The ‘chicken’ was very realistic. It came fried in a crunchy batter and dusted in a tasty seasoning. Without sauce it was dry, but luckily Becca let me steal some of her ‘beef’ sauce. I wouldn’t get it again, just because I’m a sauce person, but would recommend the flavour and texture. Becca thought that the salt and pepper chicken had a much better and more realistic texture than the beef. Becca: I ordered the Szechuan chilli beef, which had a perfect batter on the outside like the real beef version. I found that the texture inside was quite soft but with the sauce and rice it had a nice flavour and feel overall. Indy found that it filled a comfort food sort of hole — and as she couldn’t really remember what the real-meat version tasted like, thought it was a very good replica of actual Szechuan beef. Admittedly, it was mostly batter, but we’re not complaining! Service was super speedy, bordering on over-keen to clear our plates, but with accommodating and approachable staff. The meal was slightly expensive for a student meal out, but portion sizes were generous and prawn crackers were on the house. The vegetarian thought the meat was realistic, and the flavours and textures worked well together. The meat-eater found the meat somewhat less convincing, but it was still delicious and is an easy way to reduce meat intake. (Lotus is cash only; there’s a cash machine in a nearby Sainsburys if you forget to prep in advance).